After a few months operating and managing our new website, we will be officially launching MyReturns.ie to the public in the following weeks. A few months ago we mentioned in our blog that with an approximate rate of 40% returns from online purchases, Returns Collections was an area that deserved our attention. In fact, recent surveys and studies have found that over 85% of consumers want a convenient returns policy, with about 55% seeking the most affordable return shipping option. In the, UK research (by virtual fitting room company, Fits.me, involving 1,000 consumers), found that 60% won’t purchase clothing online if a retailer does not offer free returns. we wish to appeal to Irish business of any size trading retail goods online… we could be of assistance! We have already counted among our clients some of the largest UK online retailers such Asos, Missguided and Boohoo. But isn’t only top fashion brands that are availing of the service, smaller Irish businesses have also been using MyReturns.ie to allow their customers to return items if needed. JewelleryToYourDoor.com, a Dublin based jewellery retailer, is one such business. “As is the case with our products, we know that most people wouldn’t feel safe returning jewellery through the post. With MyReturns.ie they know that each delivery is safe and looked after by a dedicated, reliable courier. The service also includes the option to add insurance to the delivery. The recent increase in postage charges is also a factor as a lot of people couldn’t afford to return an item to a retailer through the Post. 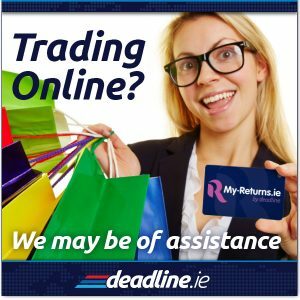 MyReturns.ie makes it ideal, simple, safe and secure and you don’t even have to leave your home to return your goods”, she said. Our service currently includes direct or next day Dublin pickups at very reasonable prices. As part of Deadline’s expansion plans, we will be extending the reach of MyReturns to a national level over the coming months. If you think your business may require a reliable and efficient “Returns” partner, do not hesitate to contact us and talk to a member of our corporate sales team.